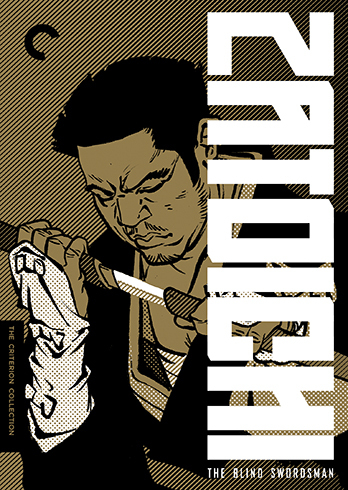 First off, the Zatoichi boxset from Criterion is a gem. You can tell just by holding it or flipping through the discs that it’s on a completely different level than all other box sets. It is the largest, most ambitious release, with 25-films total. That’s too much to tackle in a short period of time, much less to summarize in a single post. For that reason, I’m dividing these into a series of three posts. Zatoichi is genre filmmaking and it unquestionably follows a formula with few deviations, but it is still a treasure. A lot of this has to do with the time in which these films originated. They were produced during some of the best years of Japanese cinema. They followed in the footsteps of Mizoguchi’s samurai films and Hiroshi Inagaki’s Samurai trilogy, and were contemporary of some of Kurosawa’s best films. One of the films even included Yojimbo, one of Kurosawa’s most iconic characters. Meanwhile, the Japanese New Wave was in its prime, most notably Seijun Suzuki and his Yakuza films. The Zatoich was a serialized amalgamation of all of these narrative forms, and it even shared some of the same crew and cast as these classical Japanese artists. These essentially were template art films, with some thrills and adventures to keep audiences hooked. The quality varies on each film. None that I have so far seen come close to the highs of the contemporaries that I just discussed, but I didn’t expect to see Ozu, Kurosawa or Naruse. At best, they are excellent, stylized, escapist genre films. At worse, they are mediocre yet still engaging and watchable. In many respects they are like a high quality TV series today (and Zatoichi did become a series), with some amazing episodes and some that are just okay. None are poorly put together or not worth watching. Again, like a TV series today, they are easy to binge watch just to see what happens to the hero next. The premise is usually that Zatoichi wanders into a town inconspicuously where there is corruption present. There’s usually a woman in the picture, often (although not always) innocent and being taken advantage of. There are often warring factions, and when they realize who Zatoichi is, they try to lure him to their side with food, money, comfort, or whatever it takes. They are almost always unscrupulous, evil people. Zatoichi has his faults. He is greedy, likes to gamble, is susceptible to the charms of woman, but he is basically good and looks out for the common man. Regardless of what side he takes, he looks down on all who will make trouble for others. You have to suspend a lot of disbelief. Yes, Zatoichi is blind, yet he gets around very well for himself and hardly ever stumbles or runs into walls. He is always deadly with the sword, and most battles have him engaged with several people. He never strikes first, and will often kill 2-3 people with a single spin and sword stroke. And, spoiler alert, he doesn’t get killed – there are 25 movies, after all. He barely gets hurt. Sometimes the action can get monotonous because the outcome is clear; other times it is thrilling. Of the nine that I have seen so far, I appreciated the ones where they peeled away at the character. The first two, which happen to be the only black and white ones, establish the legend and develop the character. They are not short of action either, but they spend more time investigating this unique character. The films shift to color with the third film, and there’s a little more action, and they settle somewhat lazily on the formula. The high point for me was the seventh film, Zatoichi’s Flashing Sword because it makes the best use of color and is the most stylized, while deviating from the formula enough to show that Zatoichi has some weakness, can be harmed, and is capable of blood lust. The films blend together to a certain degree, but Flashing Sword’s imagery has stuck with me the most. The latter two films I felt suffered from monotony as they tried to unsuccessfully break away from the formula. One of them has Zatoichi interacting with a child and a flawed woman, which would normally be a nice change, but it came across stilted and less confident. Special Features: None yet until the end. Posted on July 19, 2014, in Criterions, Film and tagged action, criterion collection, film, japan, samurai. Bookmark the permalink. 3 Comments.